Paintable immediately with water-based paint. For oil-based paints undercoat first with a water-based paint. Drip. Drip. Drip. The sound of water dripping down a pipe can be torture. Worse still is when a small leak you’ve ignored gives you much greater grief later on. But because they’re out of reach, gutters and downpipes often get neglected. After heavy rain it’s important to check guttering for blockages, leaks and seepage. Regular clearing and maintenance doesn’t just make the exterior look good, it prevents water damage and drainage issues down the track. When water drains properly, it’s channelled away from the house, but if your gutters are clogged or have rust spots, it’s easy for rain to seep into to the roof or foundation causing all sorts of damage. Once you’ve found them, small holes and broken seams are easily sealed again with Selleys Roof & Gutter Speed Seal. The superior seal won’t crack, shrink or peel away, even in harsh weather conditions, and suits metal, tiled and colorbond® roofing. 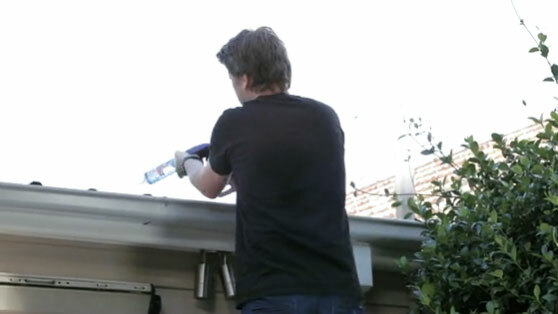 First up, clear the gutters, working away from the downpipes to avoid pushing additional debris into them. Once you’ve cleared the guttering, hose the gutter in the direction of the downpipe to make sure it’s not clogged, then inspect the gutters for any signs of damage. If you find any cracks or rusty holes, use Selleys Roof & Gutter Speed Seal, a high-grade silicone with a waterproof seal that is rain ready in an hour. The cured sealant is guaranteed to resist cracking, crumbling or breaking down for 25 years and is available in a range of colours to match your gutters. Scrape away old silicon and clean the surface with turps. Cut the tip off the cartridge and cut the nozzle at a 45-degree angle to get the right bead thickness. Place the cartridge in the corking gun and fit the nozzle. Remember to use in a well-ventilated area and keep the sealant off your skin and eyes. Hold the gun at a 45-degree angle and press Selleys Roof & Gutter Speed Seal into the joint. For a big job, do it in sections, before the sealant skins over. You can paint over with a water-based paint immediately. For oil-based paints use an undercoat first with a water base.